Unearthly Disclosure is a story of alien bases, alien contacts and abductions, genetic mutants, animal mutilations, and government paranoia. 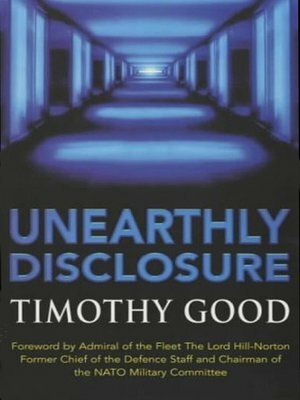 Here, Timothy Good, one of the world's most respected authorities on the alien phenomenon, reveals for the first time sensational information provided to him by high-level military and scientific sources, who confirm that aliens have established subterranean and submarine bases on Earth and that extra-terrestrial contact has been made with a select group in the US military and scientific intelligence community. Among numerous revelations in this book are those involving the alien creature photographed by Filiberto Caponi in Italy. The author spent several years investigating this controversial case and commissioned an Expert Witness checked by the Law Society to analyse Caponi's astonishing photographs. Published for the first time, this unique story forms the central section of Unearthly Disclosure.